One of the city's greatest apartment buildings, the Hendrik Hudson is an eclectic, Tuscan-style fortress that may well be the most interesting building on Riverside Drive. 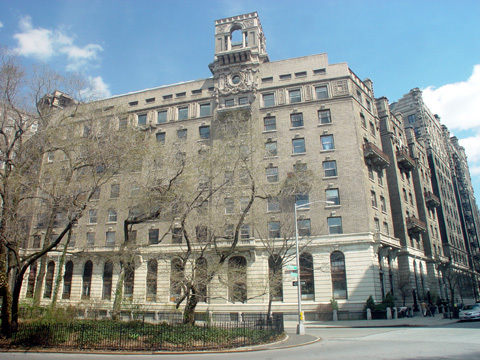 Designed by Rouse & Sloan for developers George F. Johnson Jr., and Aleck Kahn, the building sports two large, square towers along Riverside Drive and light-courts on 110th and 111th Streets. "Each of these towers is a tour de force, with open Palladian arches on all four sides, balustraded balconies and decorative terra-cotta panels. Connecting the two towers was a balustraded promenade, which for a brief time was surmounted by an open trelliswork arbor...At the base of each tower, where it joined the main body of the building, pseudo-Palladian window was originally planned. What was actually built, however, was even more grandiose: an elliptical oeil-de-boeuf window with cartouche above, carved ornamentation around and swagged garlands flanking." In place of traditional cornices, the building, which is on an asymmetrical site, has Spanish tile eaves supported by large bronze brackets and the beige Roman brick facades have balconies, spaced widely apart, some in bronze and some in stone. 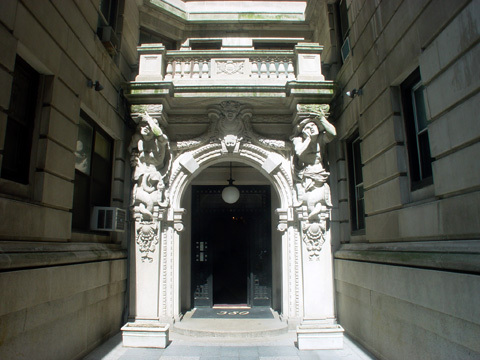 The building is ringed by a dry, railed moat and the second story windows in the two-story limestone base are arched and the main, recessed entrance on 110th Street is flanked by large caryatids. The building's name refers to the discoverer of the Manhattan in 1609. 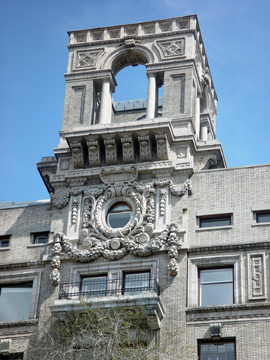 Alpern noted that elevators open onto windows facing a central courtyard and that the corridors were paved in Welsh quarry tiles and finished in imitation Caen stone and ended in windows overlooking Riverside Park. 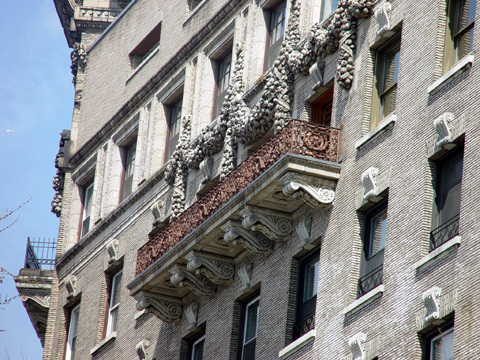 Apartments had central foyers and service entrances and many bedrooms were placed at corners for improved circulation and walnut paneling, wood-beamed ceilings and mahogany doors with glass knobs were used in the apartments, Alpern reported. 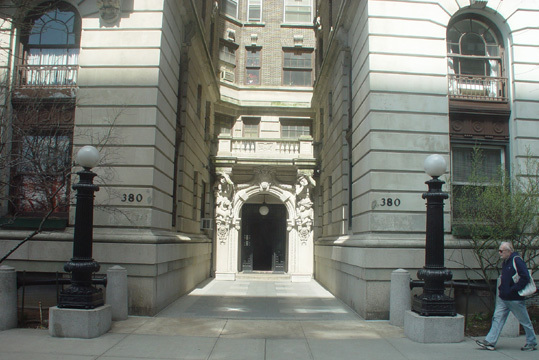 Rents originally ranged from $1,500 to $3,000 a year, Alpern noted, added that the same developers and architects erected, in 1908, an annex to the building, a 12-story building at 601 West 110th Street. The annex, which extends to Broadway, is different in style with a quite fascinating "water-borne theme" and is known as the College Residence Hotel. Many of the building's large units were subdivided, mostly in the 1940's and it was converted to a cooperative in 1970 with offering prices, according to Alpern, that ranged from $4,800 for a first-floor studio to $26,100 for a top-floor, 3-bedroom apartment with a river view and monthly maintenance of $315. The 8-story building has a very large marble lobby.